Almost everyone who plays sports is at risk of eye injury. From a flying puck in hockey to an eye poke in wrestling, all types of sports can result in eye injuries. Even the mild game of golf has a hidden hazard: the sun. Protective eyewear prevents most types of eye injury. We depend heavily on our eyes to play sports. Hand-eye coordination is key. The eye is a delicate and exposed organ. Our eyelids provide some protection. We automatically blink when an object comes rapidly toward the eyes. The next level of defense is the cornea, the outermost protective layer of the eye. A scratched cornea is painful, but it preferable to life-changing lens or retinal damage. Sports equipment such as racquetballs and baseballs strike at high speed. Eyelids and corneas are no defense against this level of force. A hard impact causes a black eye at the least, and blindness at worst. 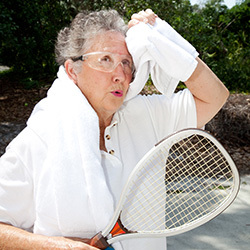 Exterior protection in the form of sports eyewear significantly reduces the chances of debilitating eye injuries. The majority of eye injuries to schoolchildren happen during sport. Sports goggles are needed for a wide of sports, active games, and activities. Each sport has a specific American Society for Testing and Materials (ASTM) code. Choose polycarbonate eyewear, which is 10 times stronger than plastic. Snow sports require tinted ski goggles. Swimmers should don swimming goggles to protect against chlorine damage. Wrestlers and basketball players can protect themselves with specially-designed goggles. Basketball causes most eye injuries in young adults aged 15-24. In some of the more violent sports such as hockey, a full facemask or faceguard may be prudent. Facemasks protect the eyes and other facial structures from damage. Helmets are crucial in preventing head injuries. A hard blow to the back of the head can cause blindness. UVA and UVB radiation damage the lens, retina, and macula over time. Protect your eyes from the sun by wearing sunglasses. Some googles have a tint or turn darker in sunlight. Winter and water sports require sun protection, as the sun’s glare is magnified by snow and water. Wear a hat with a visor, if appropriate, to provide more protection from the sun. In some sports, goggles and hats with visors are not the norm during games. Therefore, wear protective eye equipment during practices. Investing in protective eyewear for sport can mean the difference between continued play and hospitalization. The cost is small in comparison to the precious gift of sight. Up Next: Sports Eye Care. Previous Previous post: How Much Anti-Aging Supplements NAD+ and Nicotinamide Riboside Are Needed? Next Next post: What is Dr. Grossman’s Advanced Eye & Vision Support Formula?